The Mitel Superset 4001 is ideal for casual users who require basic access to telephony features. The Superset 4001 allows businesses to equip users and locations within their operations with telephones that meet their basic needs. The Superset 4001 is ideal for offices and hotel lobbies, retail stores, classrooms, shop floors, and more. 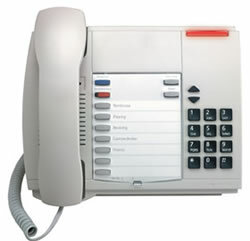 When you buy a Mitel Superset 4001 phone from Telephone Magic it comes with a 1-year warranty.